In a series of posts, Niall Corcoran our Managing & Brand Director shares some insights into the creation and thinking behind a number of our brand names. 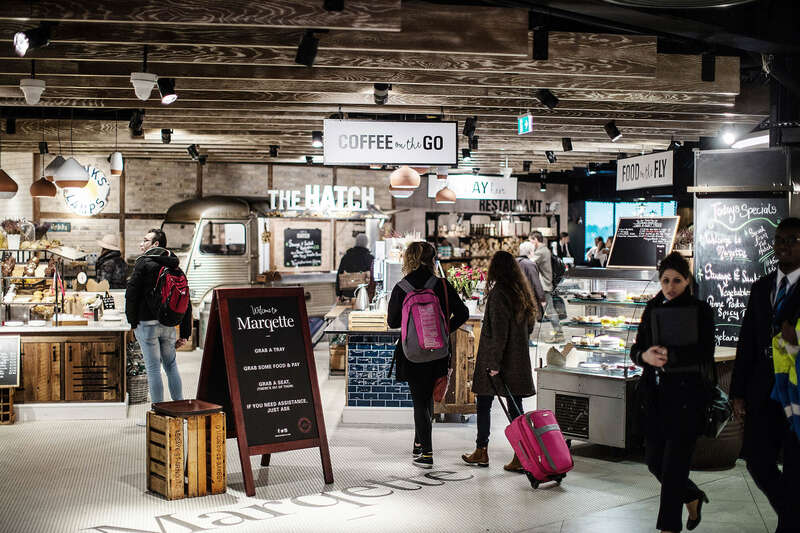 In this post we feature the new food retail offering at Dublin Airport called Marqette. We’ve worked on many naming projects over the years, naming everything from craft beers like Bo Bristle (“Don’t mess with the Boar”) to global gaming brands like Havok (now a Microsoft company). Naming is always an interesting challenge, the psychology behind a name, the emotional resonance (or not) and ever more important the commercial value, particularly if you intend to trademark or avoid infringing someone else’s. In-fact the proliferation of brands, especially online via App’s and the ever greater awareness of legal protection has made naming even more challenging and critical. One such recent example is the creation of the new Marqette brand at Dublin Airport which we worked on. Our client had won the contract with the DAA to install a new food retail offering, their concept being an outdoors food market right in the heart of Terminal 1. Having created a brand identity under another name they soon discovered that a rather large multiple in the UK owned the trademark for this name. That’s when we got the call. Naturally, they didn’t want to move away from the original concept, but being able to avoid any possible infringements and potentially develop a trademark that would allow them to expand internationally was a critical requirement. Creating a name that had semantic value, that aligned to their commercial strategy, that phonetically worked and which we believed could be visualised into a really strong identity was essential. The identity needed to work on everything from a napkin to large scale signage. The process of naming is like panning or funnelling for gold, with lots of names being discarded as you narrow down to a short list. Names like Deparcherie or Bistrodome which had a nod to airports and food were chewed over and eventually spat out. An obvious one soon rose to the top, ticking all of the boxes. The .com was available, initial searches suggested it was clear and most importantly it fit perfectly with the original concept. In-fact it was so clear, it didn’t even exist as a word or name in Google (a first! ).